Russ: He said to me that I delivered the whether forecast with a Shakespearean flair. Lucky Numbers was inspired by an incident in the 1980s where several men in Pennsylvania were able to rig the state lottery and actually walk off with their winnings scot-free (for a while, anyway). The film takes place is Harrisburg, Penn., which is apparently inhabited by ignorant slobs and morons (man, this is a bitter screenplay, and it was written by a Harrisburg native, too!). Russ Richards (John Travolta) is a Harrisburg weatherman with aspirations of being a gameshow host. He's somewhat of a local celebrity... he even has his own table at Denny's! When his snowmobile dealership is served a foreclosure notice (due to an unseasonably warm winter impeding sales), Russ cooks up a plan to rig the state lottery along with Crystal (Lisa Kudrow), the lottery ball girl, and Gig, a local con man. At first, everything seems to go according to plan. Until the first murder, that is. Then, there was that other murder. Plus, the bribery and police corruption. Hoo boy, maybe they should've thought this through a little better! This movie is trying to be a sharp, pointed black comedy. Unfortunately, director Nora Ephron never really establishes this tone. The film begins as a somewhat quirky comedy, with wacky characters (the Denny's waitress), and a quaint, small town feel. I rather enjoyed this first part. The dialogue was amusing, though not hilarious, and the acting really seemed to click. This held until just after the "heist" scene, which was also rather funny. From this point on, the movie really spirals out of control. Character after character is introduced, and the plot drags along without ever doing anything interesting. There is a subplot that goes nowhere about a local tough. A local gambler uncovers the lottery scheme and is promptly killed, exiting the film without ever validating his entrance into it. Perhaps the biggest problem with the script is in its characterizations. There is not one single person in the movie worthy of a shred of audience sympathy. Travolta's Russ is a doltish, unlikeable brut who looks down on those around him. Kudrow's Crystal is even worse, and is perhaps the worst human being I have seen on film all year. Take the scene where she is trying to get the winning ticket from the "beard" who purchased it for them to diffuse suspicion. Michael Moore, in a painfully unfunny cameo, plays the asthmatic, chronic masturbator. When he refuses to give her the ticket, demanding more money, she pounds on him until he has an asthma attack. She then holds his inhaler inches from his face, taunting him, before she watches Happy Days while he dies on the floor. What a tasteful scene! And these are just the main characters! We also have an adultrous, greedy network exec, an oafish cop, and more! Ephron seems to gravitate towards scripts with a lot of bumbling, boobish characters, and she delights in making them look idiotic on film. In this picture especially, I get the sense that we are all supposed to feel above these small-town folk. I mean, I eat at Denny's, and yet I'm supposed to laugh at Russ for having a reserved table there. I'm sorry, Mrs. Ephron, we can't all live in New York and eat at the Rainbow Room or Tavern on the Green. The point is, this mocking tone doesn't help me feel empathy for the characters...but that's ok since I hate them already. Luckily, since I love Lisa Kudrow as an actress, she escapes from this film largely unscathed, as does Travolta. No, the real blame for this stinker rests on Ephron for mishandling the tone and having a muddy visual style. The film is populated by ugly characters and is ugly to look at, which probably explains the downright ugly $10 million box office gross. Image Transfer Review: This is more of the usual fine work from Paramount. The film has a somewhat muted color palate and the image presents it very well. I noticed no edge-enhancement and just a few instances of artifacting. Black level is a bit problematic, with some scenes looking fine and others looking overly grainy. Fine detail is usually very nice, and the picture has a nice crisp look to it overall. Audio Transfer Review: This mix fits pretty squarely into the comedy mold, but one or two scenes push the speakers a little more and elevate this above the average front-heavy dialogue mix. Like all Ephron films, Lucky Numbers uses quite a few songs, and they are presented well, mostly concentrated in the front mains, but with some instruments filling out the sound in the surrounds. Dialogue is always audible over the near constant musical accompaniment. The surrounds are mostly silent except for the score, but then near the end of the film, they kick in several scenes, including a car accident, adding a bit of flavor to a mostly routine mix. Extras Review: As is increasingly the norm for Paramount, there are several extra features on this release to make it more worth your money, but the cost is still way above what the other studios are charging for far more content. I was looking forward to the commentary from Ephron (or at least, I was until I actually saw the film) because I really enjoyed her track from You've Got Mail, and I was disappointed. There are a lot of long pauses in her comments, and when they do come, they usually aren't all that insightful. She mostly sticks to stuff about the characters, describing their various attributes and such. In a troubling revelation, Ephron says she decided to do the film because of the "hilarious" line, "F--- me, no fried clams? ", which I thought was painfully unfunny. But then, I didn't think the entire film was hot stuff, so maybe I am missing some inherent hilarity. Also, for some reason, she seems to obsess about pointing out the separate "acts" in her films - she did this on both tracks for You've Got Mail and Sleepless in Seattle. Definitely not one of the better commentary tracks I've heard. More interesting is a short featurette of actor interviews. Kudrow, Travolta, and Ephron ruminate on the script, their characters, and what drew them to the project. They didn't mention it, but I'd guess Kudrow and Travolta were thinking "paycheck." Ephron was probably thinking, "I am better than you, stupid interviewer. Also, I am better than the hicks in the movie. That's why I wanted to do it!" But she didn't say that. Cough. Also included is the theatrical trailer, which succeeds in that it makes the movie look funny. HA! 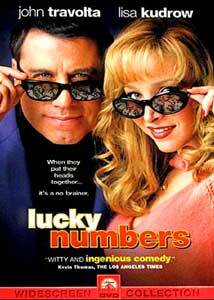 Lucky Numbers is a departure from Ephron, who has produced mostly featherweight romantic comedies like Sleepless in Seattle and You've Got Mail. Unfortunately, her limited abilities don't lend themselves to a movie with a more complex tone, and this one winds up trying to be many different things and succeeding at none. Recommend as a rental only.